Next to Chelsea Football Club, the Millenium and Copthorne Hotel is 5 minutes' walk from Fulham Broadway Underground Station. The 4-star hotel has a restaurant, sports bar and club lounge.The en suite rooms have luxurious fittings and large marble bathrooms. All rooms have flat-screen TVs, movies-on-demand and Wi-Fi access.The 55 bar and restaurant serves modern international cuisine and a range of beers and a full English or continental breakfast is available.Blues Sports Bar, formerly known as The Shed, features coverage of all events from Chelsea FC home and away games, the Rugby World Cup and the America's Cup.The tube and buses provide easy access to central London. South Kensington with its shops, Natural History Museum and the Victoria and Albert Museum is a 25-minute walk away. 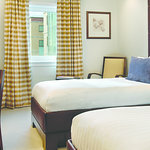 The MILLENNIUM HOTELS AT CHELSEA FOOTBALL CLUB is a Tourist, Modern, Business hotel. Located in South West area. Shopping is within walking distance and the nightlife/restaurants are within walking distance from the hotel. Descriptionclass="small" style="text-align: justify; font-size:11px;">Next to Chelsea Football Club, the Millenium and Copthorne Hotel is 5 minutes' walk from Fulham Broadway Underground Station. The 4-star hotel has a restaurant, sports bar and club lounge.The en suite rooms have luxurious fittings and large marble bathrooms. All rooms have flat-screen TVs, movies-on-demand and Wi-Fi access.The 55 bar and restaurant serves modern international cuisine and a range of beers and a full English or continental breakfast is available.Blues Sports Bar, formerly known as The Shed, features coverage of all events from Chelsea FC home and away games, the Rugby World Cup and the America's Cup.The tube and buses provide easy access to central London. South Kensington with its shops, Natural History Museum and the Victoria and Albert Museum is a 25-minute walk away. Thank you for taking the time to review our hotel. We are pleased to hear that you enjoyed your stay with us and found the room to be pleasant. We are sorry to hear that everything wasn't 100% to your liking, rest assured we will pass on your feedback and make sure it reaches the relevant departments for review. Wishing you a pleasant day and we look forward to welcoming you back in the future. We are pleased to read that you had a wonderful stay and we hope to welcome you back soon. 4 night stay - disappointed. Just got back from a four night stay at the copthorne hotel. The great thing about it was the location and the breakfast was satisfactory, however I was disappointed with the hotel itself. The room I stayed in was quite old, had a lot of marks on the walls and stains on the floor. The lighting itself in the room was poor, even with all the lamps switched on, I found the room to be dark. No complaints about the staff. Thank you for choosing Copthorne & Millennium Hotels at Chelsea FC. We appreciate you taking the time to share your feedback with us. However, we are sorry to learn that there were issues with the condition of the room, which I do apologise for. We thank you for your feedback, and we hope that you will consider staying with us again in the near future. Been Before & Going Back Next Week! I have stayed at this hotel a bunch of times before, a couple times for Chealsea Football Matches and a couple times just because it is a nice hotel, the visits have ranged from just my husband and myself, with friends and 2 times on my own... there are multiple reasons we keep returning, location is convenient, the hotel is clean & comfortable, I run and it is close to the major parks/ gardens and I can do a great loop in which I see a ton of sights (I run distance so I seen everything from Big Ben, London Bridge and Piccadilly). I am reviewing for the first time before I even depart on my trip which is a few days away, because of the service I have already received before I even arrive. Erika at the hotel has made modifications to our reservation seem less, I did not deserve this level of accomidation they extended me as I had made an error on booking and then after she had set me up properly she also helped me adjust and extend my stay. We have had multiple emails back and forth trying to get my reservation settled the way I needed, and she has been amazing! I am starting my trip already impressed with this hotel and inparticular the service we have received from Erika! Thank you very much! We look forward to staying with you! Thank you for your time to write us your amazing review. We are very happy to hear that you are happy with Erika that extended you her usual excellent service. We are looking forward to welcoming you at Millennium and Copthorne Hotels at Chelsea FC. If there's anything we can do to make your stay a memorable one please do not hesitate to let us know. Breakfast very good with a good selection of hot food, fresh fruit, pastries and cereal. Thank you for your time to write us your excellent review. We are very happy to hear that you've enjoyed our warm and friendly service.